Chelsea’s husband texted me earlier in the week about doing a surprise for Chelsea. 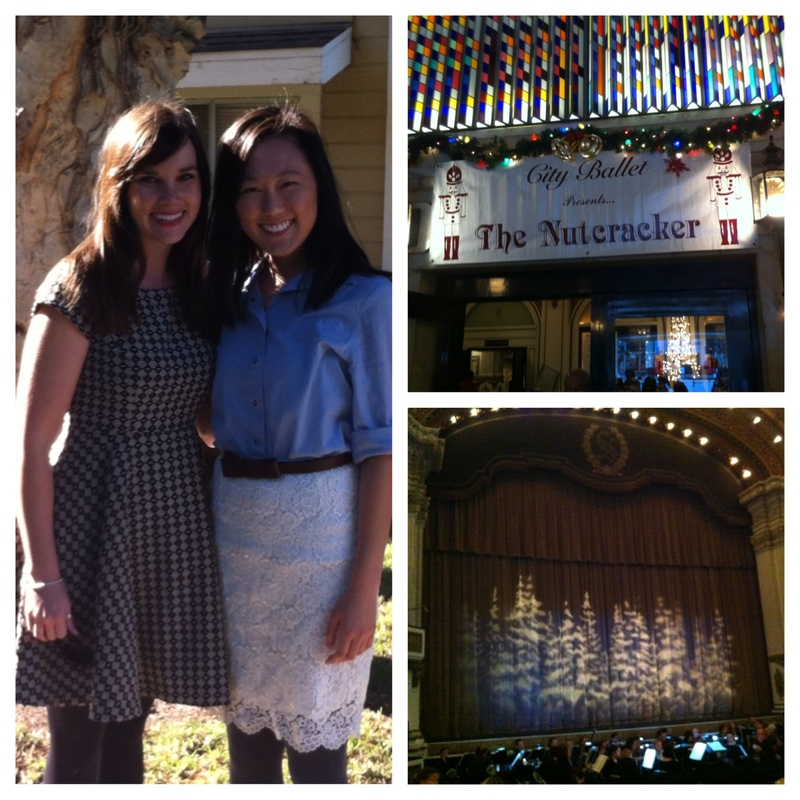 Chelsea told Eric, her husband, how she wanted to see the Nutcracker and that the last time she saw it was with me. So Eric, the loving husband that he is, thought it would be a great idea for me to surprise her at the door and then take her to watch the Nutcracker together. Great idea, huh? Uh-huh. When I arrived in Diego, I texted Eric that I had just parked. He responded that he was going to “poop” so that Chelsea could open the door. I knocked on their door and looked down on the ground so that she would not see my face through the peep hole. She opened the door and I actually don’t remember the first thing I said to her exactly. But I must say she was definitely surprised to see me! She kept asking me what I was doing at her place. I responded casually saying, “I was just around the neighborhood.” She kept asking me the same question why I was there. At some point I asked her if I could come inside since I was just standing there with my bag of Korean pears to give to them. Eric and I ended up explaining the whole surprise to her. She responded, “No wonder Eric kept telling me to get ready!” I told her that we only had an hour left until the show starts. So she quickly got dressed up and we were off to downtown San Diego! We grabbed a quick bite at Sushi Deli which is Chelsea and Eric’s favorite place. Service was great there. Since we were in a time crunch, we couldn’t order a lot but we ordered enough. We literally had 15 minutes left until the show started. We told the waitor our time crunch situation and he was definitely understanding and was quick to give us our food in less than 5 minutes! So we got some California Rolls and garlic edamame for about $6. I need to try that garlic edamame again the next time I’m in San Diego. They were really good! 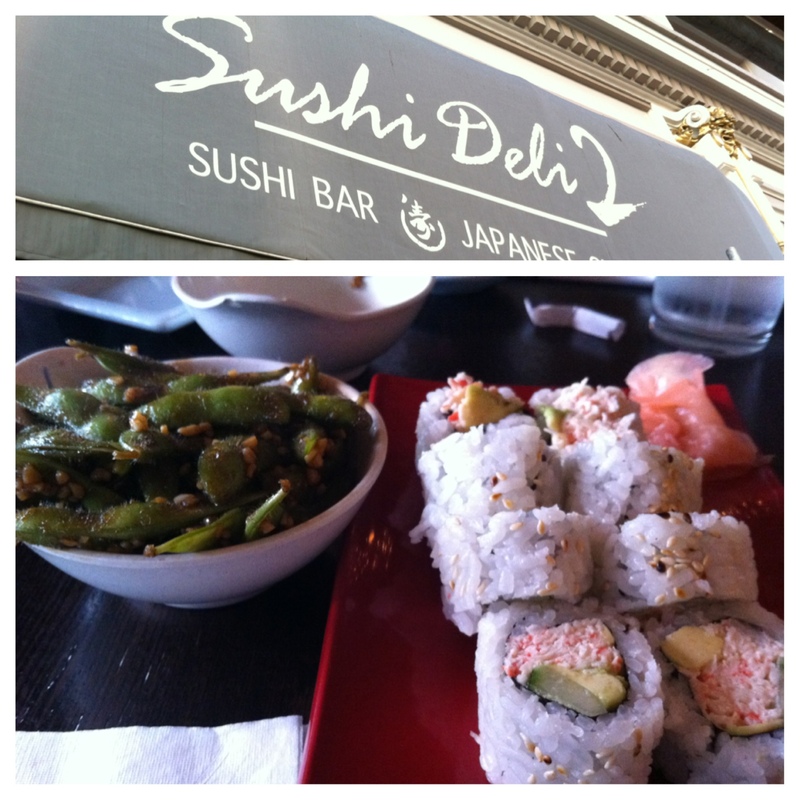 Luckily the theater was one or two doors down from Sushi Deli. So we power walked to Spreckles Theater. Yup, it’s called Spreckles. Don’t ask why. I thought the same too. We made it right on time for the show to start! This Nutcracker performance was definitely one up than our previous Nutcracker show. There was live music and the story line made more sense than before. We’re hoping to start a new tradition to step up the quality of the Nutcracker as we get older! I already can’t wait for the next one! Thanks Eric for planning all of this! Chelsea, it was so good seeing you! Glad we were able to watch this together!